Every so often we fall in love with an element of a design concept that for one reason or another doesn’t end up in the final product. That was the situation we found ourselves in while working on a series of infographics for the eighth edition of WW Norton’s “Introduction to Sociology” textbook. 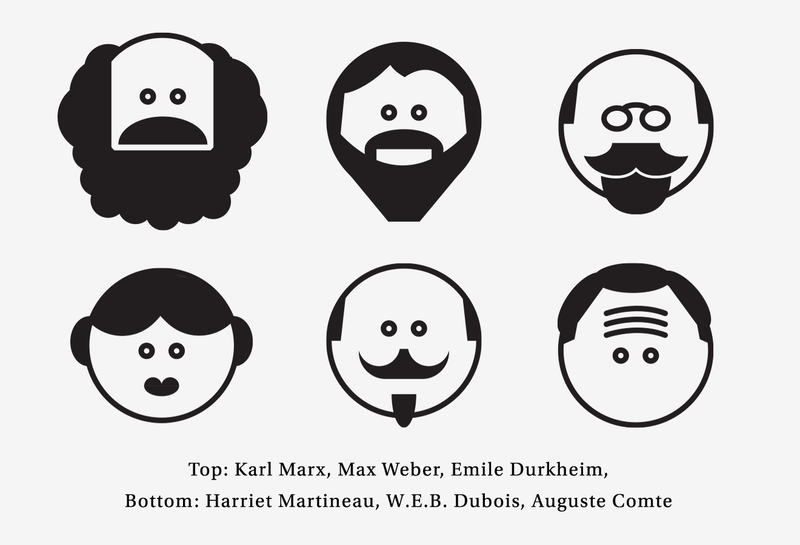 Originally intended for use in a timeline of landmark sociological publications, we designed miniature character illustrations for the authors responsible for some of the iconic works. When these icons didn’t make it into the final infographic, the folks at WW Norton decided to give them another chance by using them on buttons that were handed out at the annual American Sociological Association meeting in Las Vegas earlier this summer. Apparently the buttons were a big hit – with Marx and Du Bois “selling out” first. Stay tuned for more additions to the collection in the near future! In the meantime, check out our full case study.